The Aam Admi (Common Man) Party’s meteoric rise quickly became an Indian political legend and last week, in yet another plot twist, the party’s leader Arvind Kejriwal resigned. The AAP came to power on a populist anti-graft ticket; in the face of mounting opposition to its signature anti-corruption bill, Kejriwal fell on his sword. But the resignation clears the way for him to contest the national elections, due by May, and the AAP’s floundering tenure in Delhi begs the question: is its anti-establishment politics viable at the national level? The AAP won the Delhi election last December in a blaze of national shock and euphoria. Yet the party’s term in office lasted just 49 days, a period wracked by successive scandals. 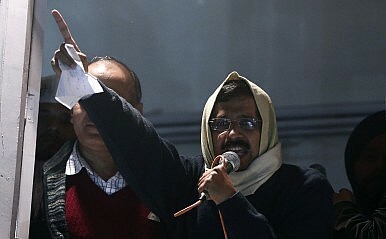 The abrupt end to Kejriwal’s role as Delhi Chief Minister marks the latest controversy, prompting concerns about the longevity of the AAP as a political organization. Kejriwal’s willingness to bring down his own government over the issue of corruption is proof for many of the man’s virtues. Indeed, he has spurned political office from the outset: “If the system worked,” he said last week at the Delhi Literary Festival, “the AAP would not exist.” But this is an odd message to pitch to voters: for a party determined to clean up Indian politics, the AAP is strikingly averse to public office. There is no doubt that Kejriwal is a shrewd politico; and his spectacular rise from social crusader to Delhi Chief Minister is as much proof of this as it is his savvy PR. The AAP rose to power on the appetite for radical change and the dismal record of its competitors. Kejriwal told Reuters, “All the other parties, their only agenda is how to make money, how to indulge in corruption and how to loot the country.” By avoiding the transgressions of its rivals the AAP has amassed tremendous political capital. But how long can this last? When pressed on issues Kejriwal’s constant refrain is “honest politics,” but this sanctimony is cause for concern. When asked about the AAP’s economic position, Kejriwal replied, “Good economics is the outcome of honest politics.” When asked about non-economic policies, he said the same: “If you have honest intentions, the solutions are there.” The inference is unmistakable: for the AAP probity (in public office) is more important than delivery (of public services). There is a sharp dichotomy here with Modi’s mantra of governance and development, which appeals directly to popular demands for observable and efficient policies. The AAP and BJP therefore present voters with a stark choice between integrity and delivery. Which will voters chose? In their annual survey of corruption, Transparency International ranked India 94th out of 177 countries, well below economic rivals China and Brazil. According to figures compiled by PRS Legislative Research, the parliamentary term due to end at the general election was also India’s worst performing, with only 165 bills passed in five years. Facts such as these bolster the AAP’s call for a radical overhaul of the country’s politics. But the party’s prospects for doing so look bleak. The AAP aims to contest the majority of the 543 available electoral seats, but opinion polls suggest it will win mere dozens. This is hardly surprising. As Milan Vaishnav, research associate at the Carnegie Endowment for International Peace, said to The Diplomat “anti-establishmentarians” such as VP Singh, India’s short-lived seventh prime minister, tend to “crash and burn” at the national level. This checkered history might explain why Kejriwal committed the party to an opposition role: “we will be there [in Parliament] to ensure corrupt work is not done,” he said. According to Vaishnav, the AAP is an urban force that benefited from a unique set of historical circumstances. Kejriwal’s anti-corruption campaign is untested in rural areas, and his electoral prospects are unclear beyond the metropolitan enclave of Delhi. As Christophe Jaffrelot, the esteemed South Asianist, outlined in The Indian Express recently, the BJP is similarly an urban party reliant on urban voters, making cities the likely battleground for the two parties. Targeting will therefore be an issue for the AAP: in Delhi the party won broad-based support with “elites” and subordinate groups coming together to vote. Straddling these diverse constituencies will be more difficult nationally, where the party’s message will encounter local interests and votebanks. Ultimately the problem may be a prosaic one: with months to go before Indians head to the polls, the AAP is yet to get its national campaign off the ground. Although the process of picking candidates and drafting an agenda is underway, Kejriwal admitted on air that the party is “not ready” for the national polls. The AAP is pressing ahead nonetheless, he claimed, because it is the will of the people. When the party took office, one question loomed large: will the AAP be able to make the transition from protestors to politicians? Today the question has become a bad joke: Kejriwal was Delhi’s Chief Protestor, not Chief Minister. Noted political commentator Pranab Bhanu Mehta best summed up the two central challenges for India that dominate the upcoming election: plutocracy and paralysis. Combating corruption and the corporate-political nexus on the one hand, and efficiency and service delivery on the other, are the two political projects that the AAP and BJP respectively represent. The BJP, propelled by powerful anti-incumbency sentiments, is widely tipped as the party to beat. The AAP has gambled by placing all its eggs in the former, anti-corruption, basket. In his valedictory speech Kejriwal said, “Acting against the corrupt is true governance.” This message resonated in Delhi, it remains to be seen whether it will at the national level too. Ram Mashru is the author of Human InSecurity: Fear, Deprivation and Abuse in India.